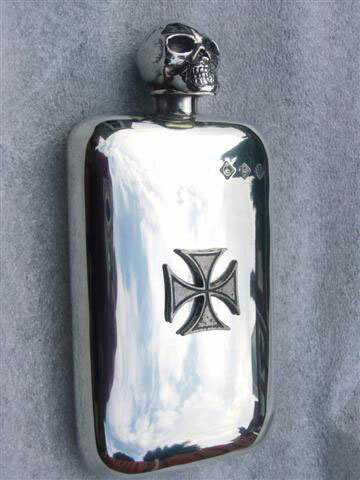 Hand made pewter hip flasks of the highest quality. A wonderful range of traditional pewter tankards and designer hip flasks, all hand made in Sheffield England from 100% lead free English Pewter. Sheffield Pewter Craft Company manufactures quality, heavy gauge pewter hip flasks in various sizes, 2.5 oz, 4oz, 6oz, 8oz, right up to 16 oz. All our pewter hip flasks are hand made in Sheffield England from lead free pewter sheet. All solders that are used are also lead free! What better way to enjoy your favorite tipple! We have a fully equiped tool room where tools can be made for your own designs and all budgets catered for!! Not only can we make different shapes and sizes but we can also etch or engrave your logos or artwork onto the pewter flasks. All we need is your design!! We have a very good range of celtic pewter hip flasks, again by either using a celtic badge that as been centrafugally cast or by etching or engraving. We are really flexible in our approach to serving our customers, new and old!